Tonight was movie night! Feeling a bit tired after working a good part of the weekend and putting in a loooong day yesterday, I decided to stop at the dvd rental store on my way home and pick up a movie. So many movies to choose from, and I only needed one. I had seen the preview for this movie, while watching something else. Its quirkiness appealed to me then and when I saw the movie had released recently on dvd, I decided to go with a fun film. I’ve seen many “based on a true story” movies lately. Something fresh and darkly comedic seemed perfect for today’s first. 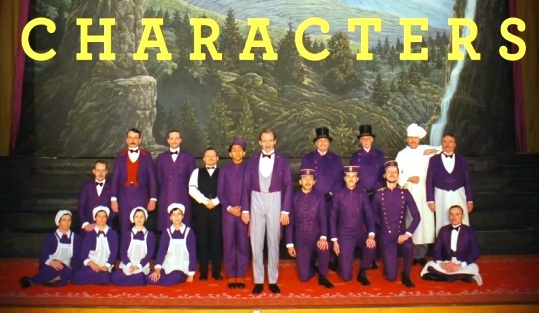 The Grand Budapest Hotel has a large cast of well known actors including, Jude Law, Ralph Fiennes, F. Murray Abraham, Mathieu Amalric, Adrien Brody, Willem Dafoe, Jeff Goldblum, Harvey Keitel, Bill Murray, Edward Norton, Saoirse Ronan, Owen Wilson and Tony Revolori. This comedy was directed by Wes Anderson and inspired by the writings of Stefan Zweig. It is rated R, for language, and has a run time of 1 hour and 40 minutes. Set in the European hotel The Grand Budapest, during war time, the story follows the adventures of legendary concierge Gustave H, played by Ralph Fiennes, and his faithful and trusted Lobby Boy, Zero Moustafa, played by Tony Revolori. The film opens in 1985 with a young woman standing before a memorial of Author, while holding his book, The Grand Budapest Hotel, and then backs up to 1968. In this era, we meet the young author, played by Jude Law, who is staying at the decaying, mostly vacant and yet still beautiful Grand Budapest Hotel. He encounters the owner, Zero Moustafa, who agrees to tell him the story of how he acquired the hotel and why he keeps it, even though it does not make him any money. Over dinner, Old Zero, play by F. Murray Abraham, begins his tale, and the movie backs up again to 1932, where we meet Zero as a youth. He has just begun to work for the famous concierge Gustave. Over the course of the movie, we learn of Gustave’s fame because of his extraordinary care of the hotel’s patrons, especially the blond, wealthy, older women who stay at the decadent palace like hotel. One such heiress dies and leaves Gustave a very valuable painting. What follows is the theft of the painting, Boy with Apple, accusations of murder, and a battle for an enormous family fortune. At the end of this funny and off beat adventure, Zero inherits the hotel. I liked this movie very much. It was very reminiscent of films by one of my favorite directors, Baz Luhrmann, who excels at quirky movies. 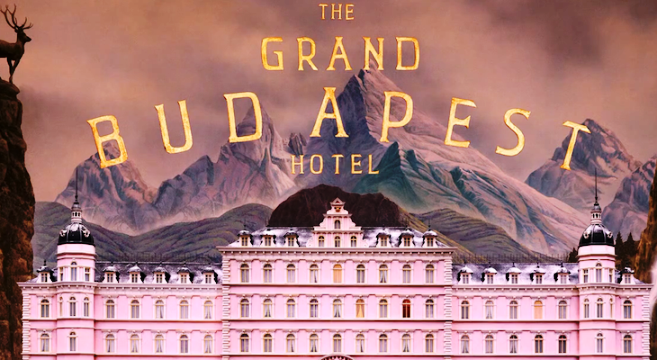 The Grand Budapest Hotel was dryly funny, with crucial timing in the delivery of clever lines. Fiennes and young star Revolori played off of each other brilliantly. I enjoyed the cameos by so many different actors. I think I smiled through the entire film. In counterpoint to the humor, which was sometimes dark, was the beautiful, artistic setting for the backdrop. This movie was a joy to watch simply because of the stunning cinematography. Ralph Fiennes character, Gustave, shines. His sense of style and grace and his strong belief in the good in people touched me and then his sudden use of “colorful” language, in the midst of reciting poetry or waxing philosophical would make me laugh. He lived in a slightly different reality than his companions, and I loved him for that. Toward the end of the tale, Zero says of his mentor and friend, “To be frank, I think his world had vanished long before he ever entered it – but, I will say: he certainly sustained the illusion with a marvelous grace!” May the same be said of me someday! I live and work in the Joplin, MO, area. I am a blogger, writer, realtor and traveler, enjoying the journey through life and helping others along the way. This entry was posted in Year of Firsts and tagged movie night, The Grand Budapest Hotel, year of firsts. Bookmark the permalink.